It began with breaking the traditional molds and has moved beyond being just a ‘conference’ to being an ecosystem of creativity, inspiration, knowledge, and a toolbox for leaders to design the best of tomorrow, today. For the last five years, it has been Asia’s largest HR technology event taking place in Gurgaon, India. But that is not where we stop. We decided to spread our wings. Year after year, TechHR has broken the traditional molds and has moved beyond being just a “conference” to being an ecosystem of creativity, inspiration, knowledge, and a toolbox for leaders to design the best of tomorrow, today. 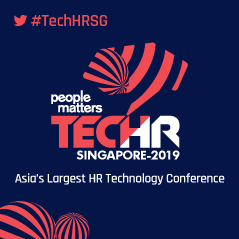 In 2019, People Matters TechHR will bring together Thought Leaders, HR Practitioners, HR Technology Product Leaders, Start-ups and Investors to build a vibrant community that will redefine the future of work in the region and raise the bar for productivity, innovation and growth. DIGITAL LEADERSHIP: Does digital transformation lead to business transformation? What does it take to define cohesive digital strategies? What kinds of leaders are needed? HR TECHNOLOGY STRATEGY, ADOPTION AND ROI: Lead the creation, execution, and maintenance of your HR technology strategy all the way to ROI for the business. FUTURE OF ARTIFICIAL INTELLIGENCE – MYTH AND REALITY: So much buzz on AI, what does it really mean for the talent function? How is AI redefining work? REDEFINE BUSINESS METRICS – TALENT, FINANCE, TECHNOLOGY: Does thinking-intensive talent drive business performance or how companies use capital?